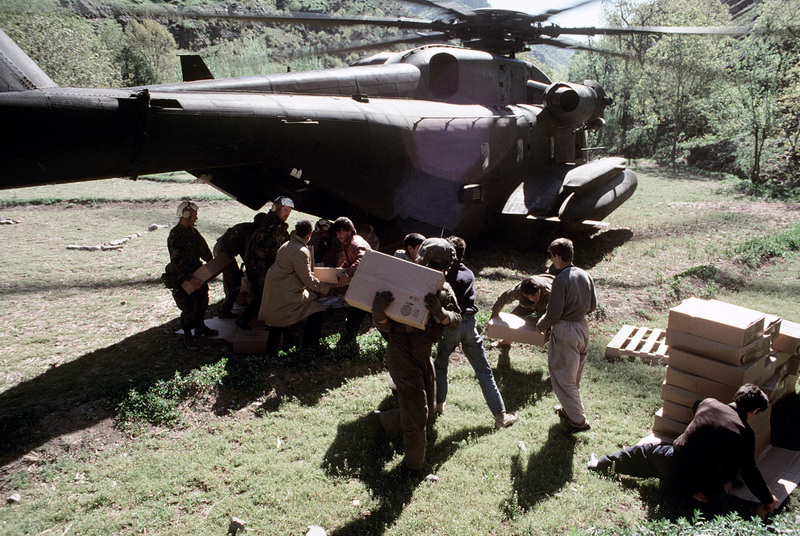 Northern Iraq, 1991: US Marine Corps personnel and Kurdish refugees unload supplies from a CH-53E Super Stallion helicopter of the USMC. Photo: US DoD. Where are the Statesmen (and stateswomen) of real worth in the world who mean what they say, take action and then follow through with a proper plan of action to achieve a just and proper outcome in a major crisis? Today in Europe they are missing, and instead what we have is a generation of leaders who have sprung from a gilded youth in the West or have been shaped by the latter days of the old Warsaw Pact. They are united in talking big and delivering little. Nowhere is that more agonisingly clear than during the migrants crisis engulfing Europe, which is being hit by a massive tsunami of population shift. Yet the men and women who hold office get away with shirking their duties to defend their nations properly, secure world order and appropriately care for the vulnerable, the persecuted and the weak that need their help. Looking on from their ivory towers behind the walls of Fortress Europe, the leaders squabble and get bogged down in buck passing, not connecting their past errors with present woes. They have the means to take action and surely the intelligence to hammer out a comprehensive plan. Instead they apply plasters to gaping wounds. Even as the literal (and figurative) Macedonian train – packed with desperate people fleeing the destruction of their nations – leaves the station, the European leaders are milling around on the platform still arguing over where next. We must also bring President Obama into focus here. His lack of global leadership makes it all so much worse – whether it is being gulled by the Iranians over the nuclear programme, refusing to arm the Ukrainians to defend themselves, turning down a request for permanently forward-based troops in NATO’s Eastern European front yard, or the Syrian imbroglio – he has been anything but decisive. Back in April 1991 a refugee crisis, admittedly less expansive but with many of the same factors, received a much more dynamic response from an earlier generation of leaders. With Desert Storm barely over, UK Prime Minister John Major was outraged by the slaughter of rebellious Kurds in northern Iraq, calling on Allied forces to intervene and set up safe havens. The Ministry of Defence issued orders to 3 Commando Brigade Royal Marines. It was to spearhead British forces involved in what was known in the UK as Operation Safe Haven, during which as many Kurds as possible would be escorted to safety. By May 11, a combined expeditionary force of Royal Marines and US Marines was preparing to assault the provincial capital of Dahuk to evict Saddam’s 66th Special Forces Brigade. The Iraqis retreated before the use of force was necessary. Two days later Iraqi troops at one of Saddam’s palaces opened fire on marines from 45 Commando RM but two of the assailants were killed when fire was returned. Saddam’s troops clashed with the Royal Marines in several firefights and came off worse each time. By the beginning of June, the task of saving the Kurds was completed and so the marines and Allied forces left, with the safe havens guarded by airpower. That was a proper way to sort out a residual problem left over from the inconclusive end to a war. On a much smaller scale to today’s situation, it was nevertheless a clear case of key Western nations taking swift action in the wake of a major conflict to provide some protection for those who were victims of an indecisive result. Today Iraqi Kurdistan is the most stable and prosperous part of a benighted country, though now threatened by the barbarians of ISIL. The frigate Richmond, which has been offered by the UK government to take part in efforts to clamp down on people trafficking between Libya and Europe across the Mediterranean. Photo: Tony Holland/AJAX. There was no such military safeguard action in the wake of the 2011 Libyan campaign, though there was a time when a temporary commitment of marines for a short period could possibly have done the trick. In any event, when dismantling a country’s political and military structure – no matter how idealistic the cause – if you can’t stabilise it afterwards (and leave it in better shape) then perhaps it is better not to go in there in the first place? That surely, is the lesson of Iraq and Libya. Fears that dictator Muammar Gaddafi would kill thousands of his own people when they rose up in rebellion sparked the West’s action – how many more have died as a result of the chaos that followed Western intervention with no adequate follow-up? Disregarding strong Russian objections, France and Britain, with some backup from the USA and other NATO allies, in 2011 used air and sea power to depose Gaddafi and assist rebels fighting him. As with Iraq in 2003, there was no substantial post-conflict plan to ensure Libya did not collapse into anarchy and become a fertile breeding ground for a much greater threat to the West. This has now manifested itself in an ISIL presence, already blamed for spawning two massacres of European tourists in, and undermining, neighbouring Tunisia. Libya has also become a major gateway for many desperate people looking to take their chances on a Mediterranean crossing for a better life in Europe, caught in the clutches of evil people traffickers who see them as mere commodities. The other source of mass migration is Syria and this is a result of no commensurate international effort to end the war. In 2013 the British Parliament, recoiling from the possibility of another unwise overseas adventure akin to those in Iraq and Afghanistan, refused to back military action to end the Assad regime in Syria, even after it used chemical weapons. The USA quailed at going it alone, yet now finds itself (along with the UK, France and others) mounting airstrikes against ISIL that partly serve to maintain Assad in power. Post-Libya, the angry Russians have been determined not to see another client state lost to Western intervention. They have cynically maintained the Damascus despot in power, free to massacre his people. Using a shuttle of arms shipments by Russian Navy tank landing ships and an air bridge, the Kremlin is currently pouring men and equipment into Syria in order create a new bastion centred on an air base (or air bases) protected by Russian marines. It is being claimed that soon Russia – which lacks an effective strike carrier capability – will begin intensive air strikes on ISIL and other rebel group from that base (or bases). Russia already has a naval support facility in Syria and has plans to again establish a permanent fleet presence in the Mediterranean. The Syrian morass – and the unjust political settlement created in Iraq after the withdrawal of American troops – is what has spawned ISIL, a cancer of terror now spreading across the Middle East and destabilising North Africa (with ISIL also intent on causing chaos in Europe). Is it any wonder millions of people from Syria and elsewhere are unilaterally evacuating themselves from their ruined nations where there is no hope of any kind of bearable existence? When will the leaders of Europe – and President Obama – mobilise with a co-ordinated plan to counter the shifting of history’s tectonic plates – to properly care for the tide of refugees breaking on Europe’s shores? What is their big idea for halting the wars and anarchy in the Middle East and North Africa, to destroy the evil people trafficking and terrorist networks? 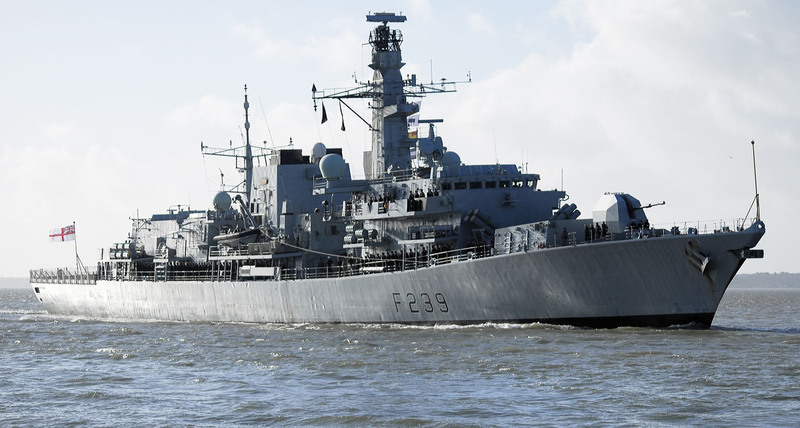 The UK offering the Royal Navy frigate HMS Richmond to counter people traffickers off Libya is a worthwhile gesture – and it follows the contribution of RFA Lyme Bay to similar tasks – but will it be matched by the other European nations? The Germans have been carrying out a similar mission for some months but even so, it is all rather far short of the effort needed. Today’s European leaders simply do not seem to grasp the huge scale of what is required. They have so weakened their naval and military forces since the end of the Cold War – though some never had much to offer even back then – that their options and ability to achieve decisive effect are deeply inadequate. And yet the military, political and diplomatic levers are all there, waiting to be pulled, but too many people have their hands in their pockets. It is time for Europe to snap out of it and also for President Obama to come up with some proper global leadership. Above all else the naval and military capabilities so long neglected and underused by Europe must be reinforced and deployed in concert – on an adequate scale – alongside humanitarian efforts and diplomacy to fight smart, to evolve a multi-layered strategy and take action. Passive acceptance of the turn in history’s tide will not do, for it will only store up trouble for the future. • This is a revised and updated version of the Odin’s Eye leader published in the October 2015 edition of WARSHIPS International Fleet Review magazine. 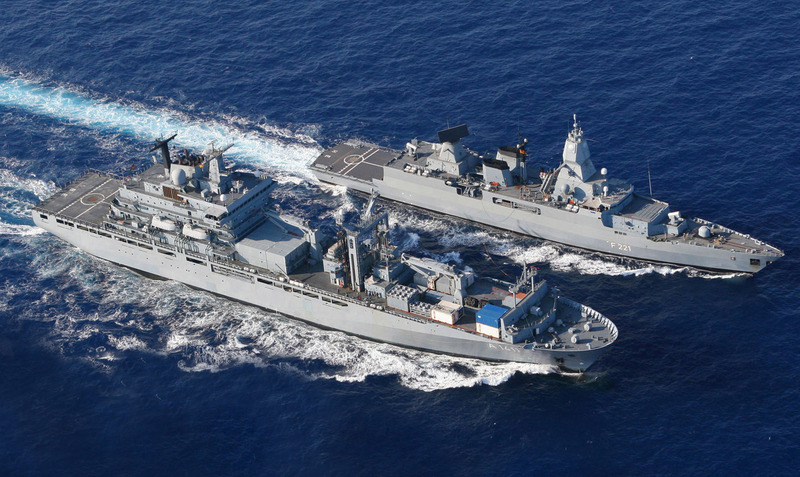 The German frigate Hessen conducts a Replenishment-at-Sea with the fleet tanker Berlin. These ships were earlier this year deployed to the Mediterranean where they rescued migrants and destroyed traffickers’ boats. Photo: German Navy.